Using real-time analytics to track customer experience. Windstream is an all-digital network service provider that leverages cloud services, IOT, and other technologies. With their growing customer base, the NSP needed a way to gather insights from their collected data to optimize the customer experience and provide excellent service. 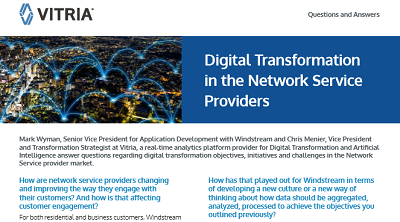 Download this Q&A with Mark Wyman, Windstream Senior Vice President for Application Development and Chris Menier, Vitria Vice President and Transformation Strategist, to learn how Windstream is using insights from analytics platform Vitria to offer a proactive customer experience.